"I have been checkingladygouldianfinch.com periodically to see your birds that need a home. 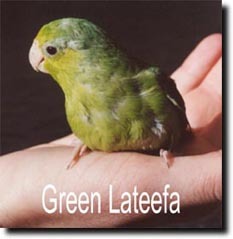 My husband and I were excited to see Green Lateefa. We have always wanted a parrotlet. We are both disabled and in wheelchairs. We would definitely understand the needs of a little bird who requires extra love. We are home most of our days so Lateefa would get more love, toys and attention than she could handle.